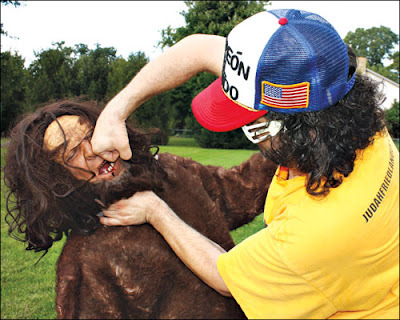 While we do not condone harming Bigfoot in any way shape or form, we give some leeway when it comes to satire. 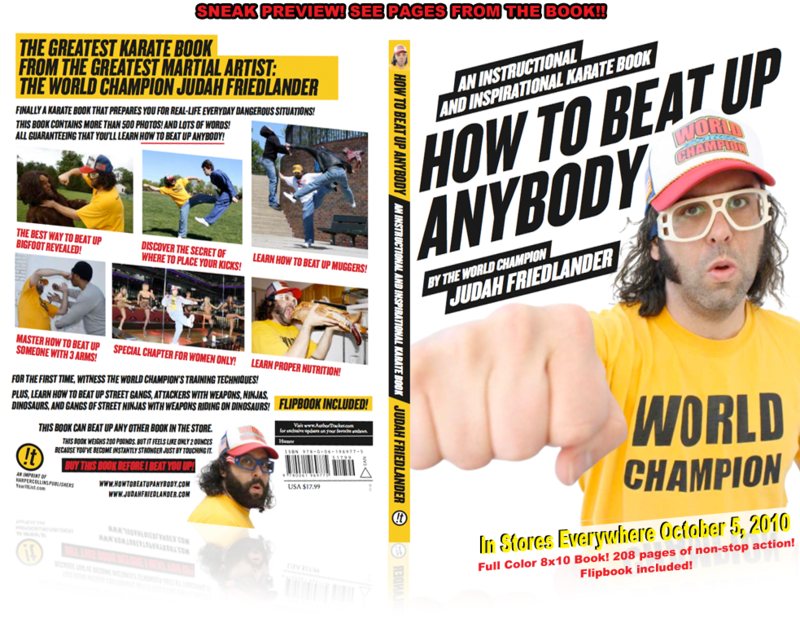 In his new book, How to Beat Up Anybody(Out today October 5th 2010), Judah Friedlander dedicates a chapter on how to take down the big guy. 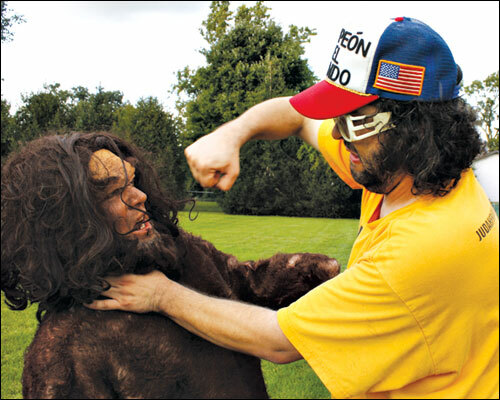 It is the twelfth chapter and officially titled "Backyard Bigfoot Attack"
1. START WITH AN AERIAL ASSAULT. It’s too risky to start with a ground attack. It is mating season for Bigfoots, and they can be extremely horny. 2. FIGHT HAND TO HAND. Never fight foot to foot with a Bigfoot. 3. DIG YOUR KNUCKLES INTO HIS BIGFOOT SKIN. 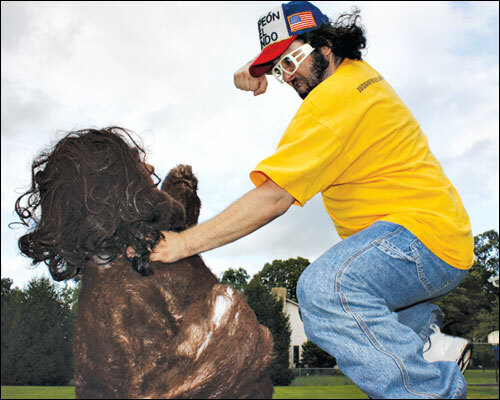 For the record, this is not a short Bigfoot. He seems small because I have resized myself to 8'5"
for this fight. (I have a separate chapter that explains "sizing," the ability to make yourself shorter or taller). 4. THE BIGFOOT TRIES TO YELL FOR HELP, BUT I SEVER HIS VOCAL CORDS. 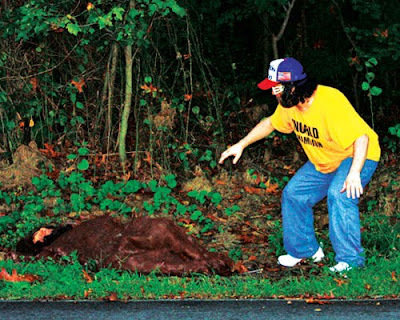 A Bigfoot’s yell can be heard by other Bigfoots 300 miles away, and they can show up in 30 seconds to help him. 5. 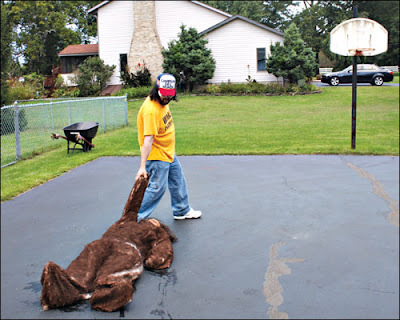 I DRAG THE BIGFOOT TO MY REGULATION-SIZE BASKETBALL COURT. 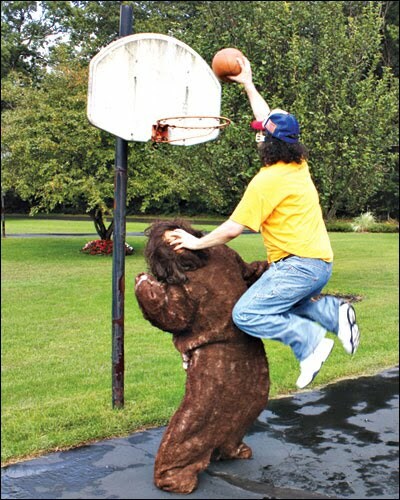 Bigfoots take great pride in basketball. It is their national sport. Not soccer, as it is commonly believed. 6. THERE ARE NO REFEREES IN BIGFOOT BASKETBALL. Dunking on a Bigfoot is one of the most humiliat ing things you can do to him. I have beaten him up physically and psycholog ically. 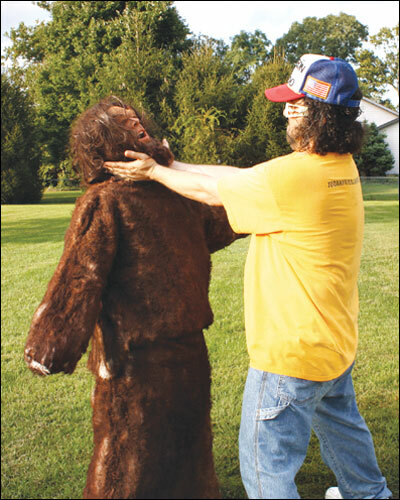 It’s time to take the Bigfoot back to the woods, where he belongs. 7. BUT FIRST I UNLOAD ONE LAST KARATE KICK. I kick him so hard, the entire planet shakes. 8. BY THE TIME I LAND, IT’S NIGHT. I’m careful to land softly, so that I don’t create a 50-foot-deep crater. 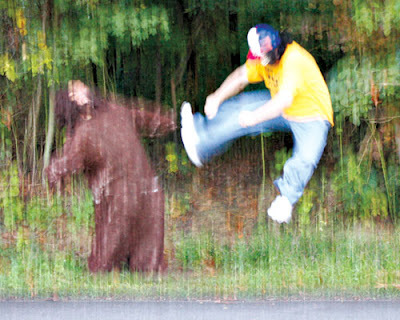 Remember, when battling a Bigfoot, fight fast. Bigfoots have an amazingly rapid recovery time from injuries. A broken Bigfoot bone can heal in six hours. That’s why you’ve never seen a Bigfoot in a hospital. If you want to learn more and discover the secret to defeating ninjas and dinosaurs, buy my book before I beat you up.